The Marx-Engels Forum is a public park which was given its name in honour of the two fathers of communism. 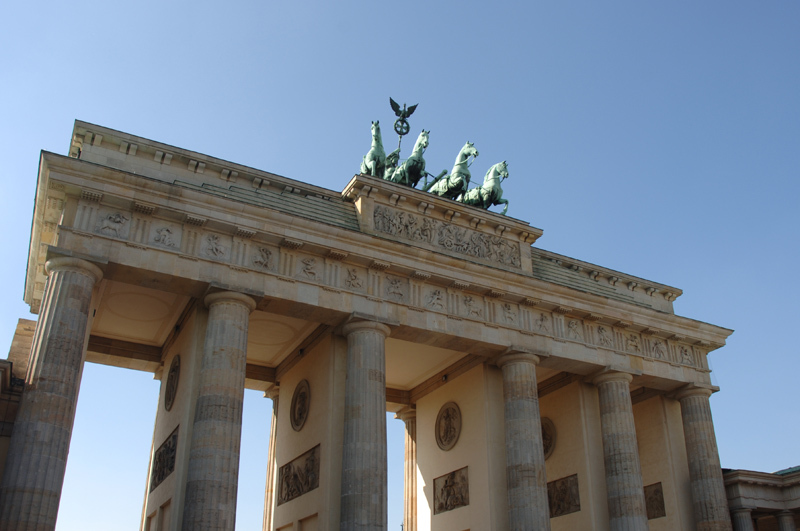 It was created by the authorities of the GDR in the 1980’s, making it one of the city’s more modern sites of interest. Before the Second World War, the space where the park now sits was one of Berlin’s most populated areas and the oldest district of the city. However, as happened with almost all the cultural heritage sites in Berlin, allied bombing left practically everything in ruins. When the attacks finished, efforts were made to salvage the shattered area but a full reconstruction plan was never considered. It was not until 1977 that the GDR authorities commissioned the sculptor Ludwig Engelhardt to develop an area in honour of Marx and Engels, founders of the communist movement. Engelhardt’s design took the form of a rectangular shaped park full of trees, with a paved circle in the centre. And it is here in this circle that you will find a bronze sculpture of these two great-thinkers: Marx is portrayed sitting down, while Engels is standing. Behind them, make sure you have a look at the relief portraying various important scenes from the history of German socialism. The Marx-Engels Forum caused controversy after Germany’s reunification. Some Berliners took the view that this park was nothing more than a relic of the former regime well worth forgetting. As an alternative, they suggested the removal of the statues and a change of name for the park. Others, however, thought it had historic and artistic value which needed to be preserved. As can be seen, the latter opinion is the one which prevailed. Over time the park has become another tourist attraction and few visitors resist the temptation of having a photo taken sitting in Marx’s lap. Without doubt, it is one of the few opportunities you will have of sitting on one of the founders of communism.